I did not get to work on steam boilers until I joined the Postal Service as a Building Equipment Mechanic. The Postal service sent me for 36 weeks of classroom training in HVAC technology. They even sent me to school to learn how to be a boiler inspector and I was temporarily assigned to travel around the Bronx and Manhattan to inspect the boilers in the smaller Postal facilities. Most of them were set up to use dual fuel because when it got real cold and the demand for gas was high we would have to switch to oil. Most of the boilers I worked on were 3 pass Scotch Marine fire tube boilers. As a BEM I had to repair some of them. Usually I did the electrics. I had a lot of experience troubleshooting control circuits so that was my job on most of the team repair projects we did. 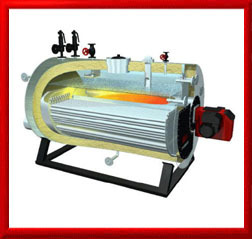 The fire tube boilers are commonly referred to as Scotch Marine Boilers because the design is a Scottish invention. This design was developed for use in coal-fired ocean going vessels in the 1800s, hence the name steamship for these types of boats. The boilers on these boats were huge and they used steam engines with huge diameter pistons so that at relatively low steam pressures the pistons can generate the torque needed to turn the crankshaft that is connected to the propeller shafts. In the beginning these boilers were in high demand and to operate them safely and properly every steam ship company hired Scottish engineers to run the engine rooms. When the captain needed more speed he would yell through a talk tube: “Scotty give me more steam”. This is the reason that the man who ran the engine room on the Starship Enterprise was called Mr. Scott or Scotty. Today the Scottish people still build great machines for the marine industry, but most of it has to do with the construction of some of the world largest deep sea off shore oil drilling rigs. Fire tube boilers are called just that because the flame from the burner gun mounted at the front of the boiler passes through hollow steel tubes from one side of the vessel to the other, hence the name: “Fire tube” The water in the vessel, which gets heated by the traveling hot gases and converted into steam, surrounds the tubes. The higher the pressure and temperature one can raise the steam to the more kinetic energy it contains and the more work it can do. Fire tube boilers cannot be operated at more than just a few hundred pounds of pressure because the design high pressure along large surface areas that could not withstand the high forces without rupturing. Indeed for all residential and commercial heating service 15PSI is the Maximum Allowable Working Pressure of these boilers. Single pass boilers were the first fire tube design, but they proved to be very inefficient because of the poor heat transfer due to the rapid velocity of the flame from the burner side to the exhaust or stack side of the boiler. So multiple pass boilers were developed. They usually 3 or 5 passes depending on the size of the boiler. Inside the back door are divider plates for the hot gases. The front section on the burner side has baffle plates too. What these do is to create a back and forth labyrinth for the hot gases to travel though. Flame pass 1 travels from the front to the back. Flame pas 2 is the bounced of the back and travels back to the front through a second set of fire tubes. Flame pass 3 bounces off the front of the boiler and travels out the back through a third and final set of fire tubes then up and out of the exhaust stack. The whole purpose of the labyrinth is too make sure that as much of the heat in the hot gas stream gets transferred to the water to heat it up. For real high pressures generating thousands of lbs of steam pressure per hour they use water tube boilers. These are very common at most fossil fuel powered electric generation plants. These boilers are very complex and vertical in design and as you can guess by the name, the water is inside the tubes and the flame is on the outside. A finished unit can be as tall as ten stories high. All boilers of all types by law must be equipped with safety relief valves and systems designed to blow off or open up when the steam pressure exceeds the maximum allowable working pressure of the boiler vessel or a deadly explosion could result. The United States Navy has ships that are all steam powered today, but the ships use nuclear reactors to generate the heat to create the steam. The steam is used to turn generators to generate electricity to drive the motorized propellers on the newest ships today. Today steam is bring used less and less to do the physical work of moving the propeller shafts and more of it is being used to turn turbines that drive electric generators that power clean and efficient electric devices to do the work.